Turkey at Kathy and Ken F’s was good. I had a nap beforehand and was still sleepy, but they had so many nice things that it woke me up. We sat and talked about family and friends. I especially like hearing about Helen’s job and meeting Jonathan her friend. Katie arrived home late yesterday and Matthew arrived home this afternoon. It’s starting to feel a lot like Thanksgiving. 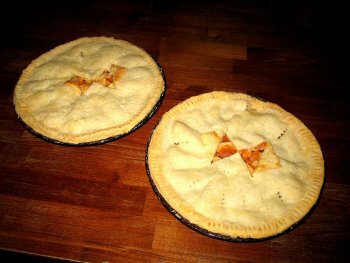 I’m in the process of making apple pies for tomorrow’s dinner. We’ll be eating with local friends. Update: Here are the scratch-made apple pies following my mother’s recipe for crusts and filling. Matthew showed up again this weekend. I wonder why. Oh come on, I know, her name is Beth. Duh. Friday night started by having Matthew come over from College Station. It seems that we have a “Matthew Magnet” and her name is Beth. We had a nice dinner out at Ka-Prow Pan-Asian Bistro around the corner from our house. Kathy and I were tired so we just headed home whereas Matthew and Beth went to the movies and saw “Saw III” – ugh. Saturday started with Kathy leaving all day to see International Quilt Festival in Houston with friends at 5:30 AM, and me doing my first Rogue Training Systems running class 10 mile long run at 6:30 AM. Matthew and Beth headed out at noon for Wurstfest in New Braunfels, TX where they sampled the beer – from what I hear a lot of beer. Afterward they stayed overnight in San Antonio at Beth’s home. With everyone away I watched the movie “Munich” on DVD and just relaxed. Kathy arrived after I had gone to bed. Sunday morning I woke early and watched the ING NYC Marathon online from NBC Sports / MediaZone.com which included the elite runners and Lance Armstrong. This was followed by another DVD movie “Syriana”. Both movies were a bit heavy and were downers. In the afternoon Matthew dropped off Beth and headed back to College Station for a Helpline shift. Beth and I went shopping for weekly groceries at HEB since she’s living with us. Sunday night we are all just relaxing and watching TV. This might now not be a typical weekend, but it was close. You are currently browsing the Watt's Up blog archives for November, 2006.